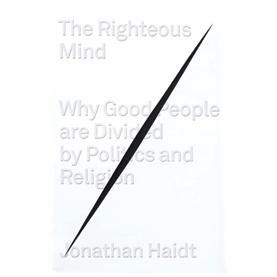 I just finished reading and contemplating The Righteous Mind: Why Good People Are Divided by Politics and Religion by Jonathan Haidt. The front covers of the U.S. and U.K. editions are shown above. Clearly, there is no need to identify which cover is marketed in the U.S. Interestingly, Haidt’s work can be used to analyze the potential appeal of the covers to different societies. 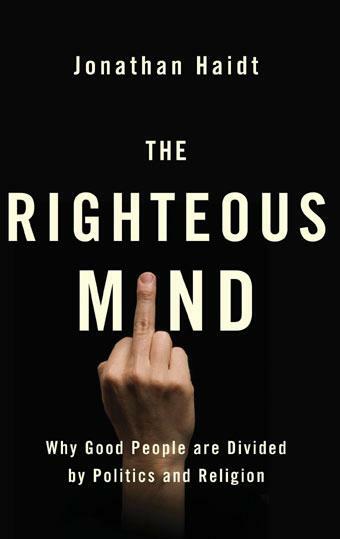 Based on its Amazon ratings, The Righteous Mind is currently one of the most popular books on ethics and morality. Impressive for anything grounded in academic research. That research has landed Haidt a plum position at New York University’s business school – unusual for someone with little formal business school training. The book provides insights into a few moral issues that I’ve been struggling with for a while. It is written as an appeal to civility in political and religious discourse – something few would find arguable. He claims that empathizing with someone on their moral terms can avoid divisions that are increasingly plaguing society. Haidt especially wants to convince those on the left of the political spectrum that many conservative positions build social capital and have moral validity while recognizing that government can and should play a role in regulating corporate behavior. I’ll present Haidt’s interesting insights that align with my experiences and intuition first, followed by some claims that I’m agnostic about and finally some ideas that are not borne out by my experiences. Several reviewer insights are presented including discussions of the underlying academic research. I then discuss Haidt’s most important points, the limitations of a descriptive modular model such as Moral Foundations Theory, and some non-intuitive claims that seem to lack evidence. I’ll explore some of my ideas on the topic in a future post. Many political messages and policies that emphasize caring, liberty and equality do not resonate with most rural and working-class citizens because they ignore the social values of authority, loyalty and sanctity – the moral capital that sustains a community. In contrast, conservative messages appeal directly to these concerns. “You can’t help the bee by destroying the hive.” Political reforms emphasizing liberty and caring often inadvertently reduce moral and social capital necessary for binding relationships, groups and communities. Intuitions come first; strategic reasoning justifying intuitions are second. People won’t believe anything that violates their intuitions so you need to understand their passions to build influential messages and healthy relationships. Haidt uses an effective intuitive approach in the book to influence me toward his views. He appeals to moral dilemmas that many have wondered about – such as why so many liberal ideas have fallen from favor over the last generation. He gets his reader to ask “Can this be a plausible explanation?” He does it so well that it takes quite a while to critically analyze his work. In contrast to the other societies, Western, Educated, Independent, Rich, Democratic (WEIRD) people perceive a world of objects rather than a world of relationships. Their morals emphasize concerns about harm and fairness to protect individuals and their rights. However, these concerns are not sufficient to build healthy relationships and thriving communities. Successful groups have moral capital that enhances social order. That capital is built on moral foundations such as authority, loyalty and sanctity in addition to caring and fairness. Diversity reduces both bridging capital (between groups) and bonding capital (within groups) by creating social isolation or anomie. While diverse perspectives should theoretically improve problem solving, building cohesive diverse groups requires extra effort to establish bonds. Resistance to authority can undermine “hiving” and cohesiveness of groups. However, unchecked power can lead to abusive within group and between group behavior. The tribes of hunter-gathers described by Haidt demonstrates the possibility of healthy egalitarian cohesive groups. Grounding morality on a single principle risks creating inhumane societies. Conservatives and libertarians view fairness as proportionality – receiving in proportion to the value of one’s efforts. U.S. liberals view fairness as equality. Happiness comes from relationships not from within one’s self. I think there’s more to life than happiness and more to happiness than relationships. We lie, cheat, and justify so well that we honestly believe that we’re honest. When nobody can find out and our actions have plausible deniability, most people cheat a little bit. Haidt defines moral systems as regulating self-interest and making cooperative societies possible. They are interlocking sets of values, virtues, norms, practices, identities, institutions, technologies and evolved psychological mechanisms that work together. Haidt agrees with David Hume: morals come from intuitions; reasoning serves and supports these intuitions. He also notes that Thomas Jefferson tended to give equal weight to passions and reason while Plato thought reason should rule the passions. Haidt cites experimental evidence of people dumbfounded by a moral dilemma despite having a strong opinion on the matter. He says these experiments support his position but I’m not convinced. It probably depends to some extent on the person. All use intuition to a certain extent, many to a large extent but some will be willing to change moral positions based on a well-reasoned argument. Haidt makes an important point about appealing to intuitions rather than reason in order to change someone’s moral position. While this can be an effective technique for unfreezing a person with a moral viewpoint on an issue, many will need some appeal to reasoning before changing that position. Reasoning doesn’t work well in oral off-the-cuff arguments because people won’t believe reasoning until they’ve processed the logic. That takes time, energy, and good reasoning skills. Some trust these skills but many more do not. Experimental evidence in favor of Hume and Haidt tends to have short time horizons that tend to favor intuition. If you look at people who change positions on a moral issue, say abortion, I think that you’d find that reasoning was a factor for many people. According to Plato’s older brother Glaucon and Haidt, “the most important principle for designing an ethical society is to make sure that everyone’s reputation is on the line all the time, so that bad behavior will always bring bad consequences.” Moral reasoning allows us to pursue socially strategic goals such as guarding our reputation and convincing others to support our team in disputes. Jesus wouldn’t have bought Glaucon’s argument that fear must drive ethical behavior. He understood the fear generated by Jewish Law in his time and the corrosive and amoral society for which it was responsible. A large part of the New Testament is dedicated to replacing this fear in society with love and forgiveness. Jesus didn’t approve of attaching “bad reputations” to those guilty of bad behavior and often demonstrated love to such people in his ministries. Despite these teachings, liberal and conservative Christian churches are divided on the extent to which fear is used to motivate “good” behavior rather than relying on love and forgiveness. Most liberal Christians take pride that their youth do not fear God or sinning while conservative Christians take just as much pride in knowing their youth do. These two groups demonstrate love in dramatically different ways. The love of the first group of parents fosters openness to new experiences, independence and curiosity in youth while the love of other parents tends to encourage obedience, rule following, and protection from harm. Approaches to social justice tend to be similarly divided. It may be that the vast majority of people tend to let their reputations drive their behaviors. However, reputational fear is far from universal and in my view, it is a mistake for Haidt to build a theory on that basis. Haidt’s political insight from this theory is that while conservatives embrace all six foundations, liberals tend to emphasize Care, Fairness and Liberty and have little use for the others. He believes that by ignoring the three foundations related to social binding, some liberal policies have inadvertently undermined the moral capital necessary for groups to thrive. Shuler and Churchland provide an academic critique of Moral Foundations Theory research in the Journal of Neuroscience. They question Haidt’s definition and use of “innateness” stating that “claims to the effect that a given behavior is “innate,” “prepared for,” or “organized in advance of experience” are much more difficult to substantiate” given recent neurobiology discoveries. They suggest that strong cases for additional moral foundations of “industry” and “modesty” can be made. In contrast, they claim that the existing loyalty and sanctity foundations might be viewed as extensions of the care/harm foundation. Perhaps most importantly, they claim Haidt “gerrymandered” the loyalty, authority and sanctity foundations in a way that makes it appear that liberals lack moral concerns in these foundations when in fact they have concerns different in content from those of conservatives. I have similar concerns about whether the model was tailored for the conclusions the author desire – a complaint that Haidt has of previous morality research. Isabel Penraeth presents a somewhat religious viewpoint with several useful insights along with suggestions for repairing and using the model. She has a nice post explaining the free rider problem with liberals in the role of bully detectors and conservatives as cheater detectors. She sees people having similar moral foundations but different triggers evoking moral responses. Her view is in contrast to Haidt who sees some people, especially those he describes as liberals, as unable to invoke some moral foundations that bind groups together. Penraeth prefers Cultural Cognition Recognition models that emphasize for group influence on morality more strongly than Haidt’s Moral Foundations Theory. I’m generally in agreement with her arguments. Chris Hedges provides a highly critical liberal review that may mischaracterize some of Haidt’s positions but provides a long form explanation of the tendency of power to corrupt the “hives” that Haidt wants fostered. Hedges clearly values governance structures within groups that ensure members are protected from various forms of abuse from within – Penraeth’s bully-detectors. Haidt’s seems to think that Hedges’ views will discourage group binding. Hedges would probably argue that he’s in favor of healthy groups binding. However, without bully-detectors the loyalty and authority foundations often enable abusive behavior both within the group and against other groups. I agree. Haidt makes no claims as to the independence of these six foundations and alludes to the fact that some may be interpreted differently. Fairness tends to be interpreted by conservatives is about proportionality – people getting what they deserve while liberals want to interpret fairness as equality. Conflicting interpretations may indicate that there is a better way to construct the foundations. These foundations would be more useful if he could support a claim that they were reasonably independent of one another. An n-dimensional Cartesian coordinate system could then be used to “plot” the independent foundations. Independence would allow each orthant to contain a consistent moral perspective. Haidt tends to generalize about human nature in ways that probably blind him to some insights from examining the variation within and between groups. For instance, Haidt claims that research shows that people are basically selfish but at the same time can be groupish. Most of us know selfish people as well as others who are pleasers to a fault – rarely getting what they want out of life, or even knowing what they want. It seems reasonably evident there are huge variations in selfish behavior between people and groups of people. He might find explanations for these variations that could enhance his models. Finally, Haidt’s theory is descriptive of what people actually do rather than trying to be prescriptive. I’m not sure he can effectively use a descriptive model to make claims about how to bridge a moral divide. However, I’ll remain optimistic on this point. Since Haidt’s book has been reasonably well received among the highly educated, maybe we’ll see some improvement in civility as a result. It would be a welcome change. Updated 0:35 22 Nov 2012 – a few typos, grammar and spelling errors changed. I’ve never seen Moral Foundations Theory indicate there being six foundations. Haidt only speaks of 5. I don’t know where you came up with the liberty/oppression foundation..
Cody – thanks for mentioning this. Haidt originally had just 5 foundations but seems to have accepted the liberty/oppression foundation in his book and recent articles. The six foundations are described in Chapter 7 of his book. You can download the chapter at http://www.moralfoundations.org/. His thoughts on how the six foundations can be applied to Occupy Wall Street are at http://reason.com/archives/2011/10/20/the-moral-foundations-of-occup. The sixth foundation helps make his case about the moral differences between liberals and conservatives and generated a substantial amount of interest in MFT. Awareness in the Age of Electronic Communication: Are we Alone Together?